Aquatic and semiaquatic mammals are well adapted to life in the water with physical characteristics such as flippers, webbed feet, paddlelike tails and streamlined bodies. Whales, dolphins, porpoises, manatee and dugong are completely aquatic; seals, sea lions, walrus, hippopotamus, platypus, otters, beavers and nutria are semiaquatic, spending part of their lives on land. Whales have streamlined bodies tapering toward the horizontal tail that distinguishes them from fish. Their front limbs have been modified into broad flippers. Whales lack back limbs and external ears. 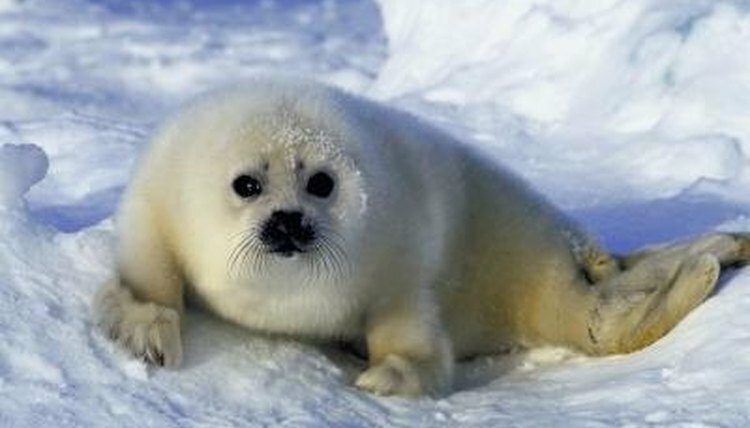 A thick layer of blubber beneath their skin helps to conserve heat. Whalebone whales do not have teeth, but plates of baleen or whalebone in their V-shaped upper jaw, which act as sieves or strainers for plankton. The coarse, frayed inner edges catch the tiny creatures on which the whale feeds. Whalebones are the largest whales -- the blue whale, the largest animal ever known to have lived, reaches up to 100 feet and 200 tons. Whalebones include the Californian gray whale, rorquals or fin whales, blue whales and the Greenland right whale. Toothed whales are much smaller than the whalebone whales. They have conical, pointed teeth in the lower or both jaws, or one tusklike tooth in the upper jaw. Toothed whales feed primarily on fish. Whales in this suborder include river dolphins, beaked whales, sperm whales, beluga or white whales, narwhal, killer whales, Atlantic bottlenose dolphins and the common or harbor porpoise. Seals live in the oceans of the Northern and Southern hemispheres, primarily in polar, subpolar and temperate climates, with the exception of tropical monk seals. These semiaquatic carnivores have a streamlined shape, flippers and webbed feet. They have no visible external ears. Millions of years of adaptation to the sea have made seals expert swimmers and divers, but they are quite awkward on land. A thick layer of oily fat or blubber up to 3 inches thick insulates them by maintaining a body temperature around 100 degrees Fahrenheit. Among the 18 species are leopard seal, harp seal, common or harbor seal, gray seal, Weddell seal, spotted seal, ringed seal and Baikal seal. Sea lions have conspicuous external ears. Their four limbs give them good mobility on land. The 13 species of sea lions are divided into two groups, sea lions and fur seals. The California sea lion, native to the southwest coast of North America, is the most abundant species of sea lion. The northern fur seal migrates in winter from the Bering Sea to California and Japan. The walrus is found in the Arctic Ocean and in subarctic seas. Walruses spend much of their time on land, but they are graceful in water. They dive up to 180 feet deep for clams and shellfish on the ocean floor, staying underwater for up to 30 minutes. The adult male walrus weighs more than 2,000 pounds. Its upper canines form tusks up to 27 inches long that it hooks into ice floes to pull itself out of the water. Walruses live up to 40 years in the wild. Manatees are completely aquatic, but like all marine mammals they need to breathe. While resting they can stay submerged for up to 15 minutes; while swimming they need to breathe at the surface every three or four minutes. Found along the coasts and estuaries of Florida, Central America and the West Indies, the massive, slow-moving North American manatee is one of three species of manatee. It grows up to 13 feet long and weighs up to 1,300 pounds. Its diet is composed of water grasses, weeds and algae, and it eats as much as one-tenth of their body weight every day. The average life span in the wild is up to 40 years. Dugongs grow up to 10 feet long and weigh 510 to 1,100 pounds. They are closely related to manatees, and they never leave the water. Unlike the manatee they have a hairless body and a fluked horizontal tail like a whale's. They can stay underwater for up to six minutes. Frequenting the warm coastal waters of the western Pacific, Indian Ocean and Red Sea, dugongs are often observed alone or in pairs, and sometimes in herds of more than 100. Dugongs root for water grasses day and night. Docile dugongs are long-lived in the wild, with an average life span up to 70 years. The hippopotamus loves water and stays submerged up to 16 hours of the day. With its eyes and nostrils set high up on its head, it is often tall enough to stay submerged and breathe at the same time. Hippopotami leave the water at dusk to feed on land vegetation. Found only in rivers in Africa, hippopotami are between 10 and 15 feet long including the tail. They weigh 5,000 to 8,000 pounds and live an average of 40 years in the wild. Semiaquatic river otters, like other amphibious mammals, have dense, thick fur and streamlined bodies designed for life in the water. There are several species; the North American river otter lives along rivers, lakes and large creeks. River otters weigh up to 18 pounds and reach up to 4 feet long, including their tail. Sea otters are the largest member of weasel family, and the only one that lives almost entirely in the water -- hunting on the ocean floor, and coming to the surface to eat, groom, rest and socialize with other otters. The average adult grows up to 5 feet long and weighs up to 70 pounds -- females are slightly smaller. Populations throughout southeast Alaska, British Columbia and Washington are stable and increasing, while the numbers of sea otters in southwest Alaska are declining mainly because of predation by the killer whale. Sea otters can live up to 25 years in the wild. Primarily aquatic, beavers are found in rivers and lakes in Europe, Asia and throughout North America, except northern Canada, the southern deserts of the United States and Mexico. They have a waterproof coat, closable ears, closable nostrils, paddle-shaped tail and webbed feet. These 30- to 50-pound rodents can greatly change whole environments with their dam-building activities. Introduced intentionally and accidentally to North America, the nutria or coypus is native to Central and South America. It weighs up to 25 pounds. Well adapted to a semiaquatic life, nutria have small eyes and ears, and large, webbed hind feet for swimming. Muskrats are good swimmers and can stay underwater up to 17 minutes, preferring to live in 4 to 6 feet of water. Found in swamps, marshes, and wetlands from northern North America to the Gulf coast and the Mexican border, they are about 2 feet long and up to 4 pounds. The duck-billed platypus lives in the freshwater rivers and streams of eastern Australia, Tasmania and New Guinea. It lays eggs and has a long, leathery bill equipped with electroreceptors that help detect the magnetic fields of the aquatic invertebrates it feeds upon. Platypus are up to 2 feet long and 4 pounds. Their average life span in the wild is up to 17 years. What Are the Important Body Features of Pink Dolphins? What Marine Animals Are Herbivores? What Is a Whale Fluke?